Below you can see the cartoon of the famous story, found in Genesis 37, where Jacob gives a coat of many colours to his favourite son, Joseph. I spent quite some time designing each son’s costume, paying particular attention to colours that reflect the prophesy Jacob speaks over each one, in Genesis chapter 49. 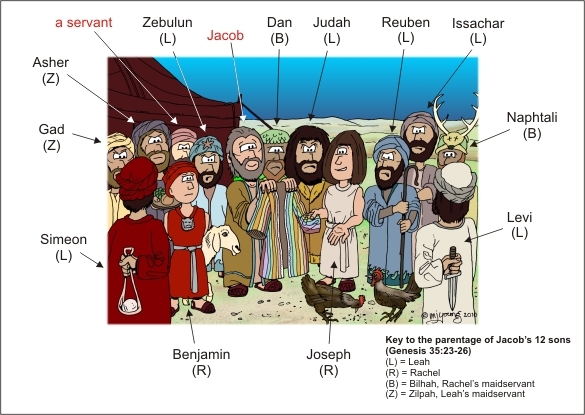 Below is a copy of the Genesis 37 cartoon, with labels to show who is who. Reuben (Jacob’s oldest son) is described by Jacob as being ‘as unruly as the waves of the sea’ & so I thought I would create a double sea wave pattern with a blue & green colour scheme on Reuben’s robe, which reflects this prophecy. I have shown Simeon in the above cartoon illustration with is back to the viewer, on the left. He is dressed in blood red colours, & has a sling & stone behind his back… truly a man of violence! Along with his brother Simeon, Levi is described by his father Jacob as a man of violence. I decided to use 2 crossed swords to represent that violent nature. The colour scheme I chose for Levi was silver & brown on white. In the cartoon above, you can see Levi on the right of the scene, with a dagger clasped behind his back. I have shown Judah in the cartoon above as having a great shaggy mane, quite literally like a lion himself! He is also dressed in a yellow/orange lion-coloured robe, complete with fur trimmings! In the cartoon illustration above, Dan can be seen behind the multicoloured coat. Dan is clothed in serpent green. I decided to take the connection between the snake & Dan more literally, & showed him in a green scaled, snake-skin robe! ‘Naphtali is a doe set free that bears beautiful fawns.’ This is how Jacob describes his next son. I depict Naphtali himself in the right of the illustration above, complete with deer’s head robe! You can’t see much of Gad, the man, in the above illustration, but he carries a big scimitar sword & is dressed in a pale yellow robe. The Asher character in the above cartoon illustration is dressed in grape-purple robes, holding a plate of food in his right hand! The man Issachar can be seen standing on the right of the cartoon illustration above, with robes of donkey-grey colour. The man Zebulun can be seen to the left of Jacob in the above cartoon, with blue/green sea coloured robes, complete with a brown starfish pin holding his turban together – which is my reference to the sea for him! That also differentiates him from Reuben, who also has sea coloured robes. In the illustration above, Joseph has taken off his old outer robe (unseen) & is only dressed in his inner robe. We see him here receiving the new multicoloured robe from Jacob, his father. This youngest son of Jacob is shown to the left of the cartoon above, in red & grey robes. He has a wolf’s head pendent, & even his turban appears to have wolf-like “ears” in it! I have made the skin & hair colour of several of the son’s of Jacob similar, which is to reflect their particular parentage. We know that four different women gave Jacob his 12 sons. I thought it might be interesting to make all the sons of Leah have the same skin & hair colour, whilst the sons of Rachel, Zilpah & Bilhah should also share their own particular skin & hair colouration. The sons of Leah were Reuben, Simeon, Levi, Judah, Issachar, and Zebulun. Jacob’s sons – who’s who?